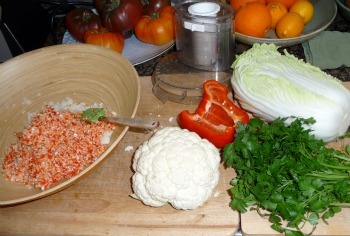 This is another take off on the raw rice recipe. 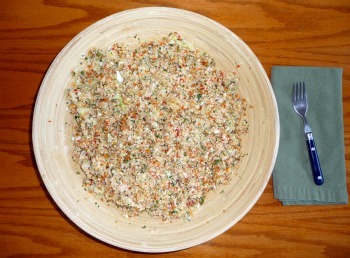 You can do so much with the basic napa cabbage and cauliflower mix; spice it up one way or another to change the flavor in any direction you want to go. This is a really tasty recipe I would be proud to serve for friends. Process the first 6 ingredients in a food processor until they reach a fine consistency (about the size of rice) and place in a large bowl. Stir in sun dried tomatoes, raw olives, and lemon juice and mix well and serve. Serves two as a main dish or 4 to 6 as a side. Amazing zesty taste. both my wife and I loved this and the easy clean-up. Join in and write your own page! It's easy to do. How? Simply click here to return to Raw Rice.